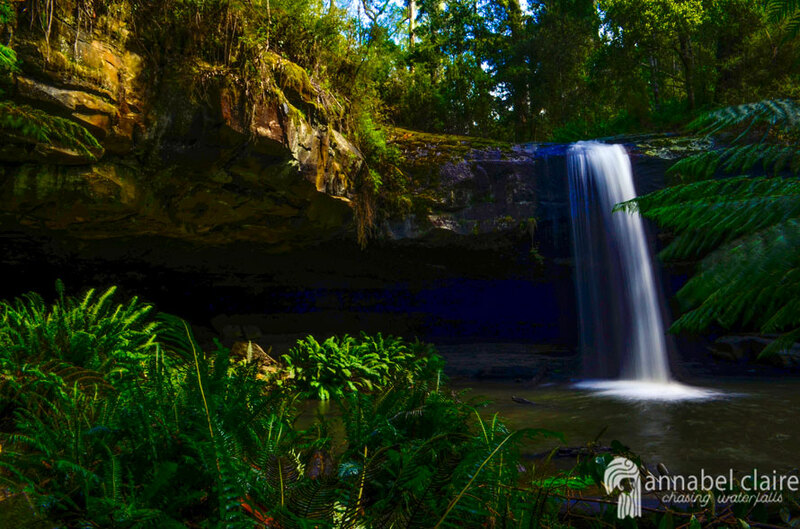 One of the most unique waterfalls in Lorne is Lower Kalimna Falls. Photographs I had seen made me giddy with excitement as I begun my journey from Sheoak Falls Picnic Area. Unlike when heading to Won Wondah Falls and Henderson Falls, the track to Lower Kalimna Falls (and Upper further along) begins on the opposite side of the carpark (behind it). If you decide to venture to Won Wondah Falls and Henderson Falls, the track to Lower and Upper Kalimna Falls intersects, however this was closed when I visited due to recent weather. However, trekking from this track would make your journey much longer anyway, so you’re better off beginning from the carpark. The track that begins from the carpark is also subject to weather conditions, and this warning sign at the beginning made me thankful I had chosen to wear my Hunter Gumboots. So I shouldn’t have to stress enough: take care when walking on tracks like these. As you can see, though, aside from some debris and weather damage, the walk is quite flat and easy. I crossed the first bridge with ease. Squelching through the mud actually became quite fun, especially since the sun was out and shining through the trees. The river gushed past as I continued on. I then came across what I presume was the reason the connecting track to Henderson and Won Wondah Falls was closed: A friendly reminder that nature can be very dangerous. At this point, Lower Kalimna Falls are only 1.5kms further, and Upper another 2.6kms. I’m not quite sure how accurate these distances are, though, because the trek felt extremely long to me. It was fascinating to learn how old this track really is, particularly the old tramline track. The sign indicates that the physical remains of such infrastructure is “rapidly decaying.” It made me shiver. But, a bridge in much newer condition restored my confidence in the track. More fresh, flowing water was also a good sign that I was getting closer. And sure enough, I hit a muddy fork in the track, where Upper Kalimna Falls continue straight ahead, and Lower deviates to the right. It’s a short, slightly slanted track down to Lower Kalimna falls, which soon appear magnificent through the ferns. I was mesmerised with these falls, as I always am when a cave has been eroded behind a waterfall. I stood in my gumboots and raincoat, underneath the powerful flow of water. I’ve seen photos of this place during drier months, and they’re nowhere near as incredible, so I highly recommend visiting from June-September after rainfall. After admiring the falls for some time, I headed further for Upper Kalimna Falls. Head there with me! Hey girl! I’m nominating your blog for a Liebster Award! The award was created as a way for bloggers to promote other up and coming bloggers within the community! I loved the idea and hope you’ll participate as well! You can check out my post about it here.. Cheers and keep up the awesome work! ?